There are events in life which make a deep impact and even can change a person completely. One such major event happened to me back in 2010. Since my early twenties, I had been deeply interested in past life regressions, but never had the courage to ask somebody to assist me. I was afraid of what I would have seen and of pains or trouble coming up again or re-living them during the session. Nevertheless, I had absolutely no doubt that “past lives” existed or that I would be able to remember them in some way. In 2009, I started self-inducing hypnosis and began to see things. The first “views” were merely spots, I was aware of my gender (which changed), approximate age, time period and country. The images were vivid but short. In the very first, for example, I just saw myself with certain linen clothes under a tall stone portal, which lead to a fish market, where I was directed in order to buy some fish. It was not for me, but for the mistress I was working for, in the Netherlands of the 16th Century. There was not much more information. But that experience led me to do more of these regressions, of which I took notice. As a muscle strengthens with exercise, so does the brain with memory. My records became longer and longer. But the most impacting regression was spontaneous. Without any meditation or autohypnosis, it was more like dreaming while awake. I was breastfeeding my baby while lying on the bed one afternoon. I had just come out of my latest pneumonia episode, which repeated every year, around the same time, since 12 years. This year, I had the worst episode ever, with one week of 40°C fever (104° Fahrenheit). I was asking myself why this happened to me every year. I was sure that there was a deeper reason for this. While reflecting on this question, I saw (like dreaming with open eyes) many people walking on a street, over a long distance in a village that looked familiar to me but I was not immediately able to make out what the place was. There were women, men, kids of all ages, walking on the streets, passing close to houses, cottage gardens and orchards, but this was not a walk for pleasure. The people did not lift their eyes from the street and were visibly weak and exhausted. There were guards forcing them to walk more quickly and not to pause even if they were too ill or tired to put one feed after the other. The inhabitants of the place were used to see similar scenes. This vision was somewhat softened, I did not understand the details, I just saw it like packed in cotton, as if I saw everything from a too far distance. I realized after a while that the village was that of Oranienburg, close to Berlin. I immediately understood who all these people were. I then wondered how the people of Oranienburg could bear seeing all these innocent people, all that desperation. 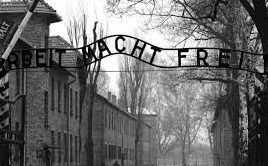 And how could they say, later, that they didn’t know or understood what was going on, in the concentration camp of Sachsenhausen, close to there. People kept living in these places for decades defending themselves. Probably many (not all) were convinced Nazis, others just “did not want problems”, still others closed their eyes. The vision changed. I started to see a tile. A dirty blue or greenish colored tile. I became aware of literally fixing that tile and wondered why. In that same instance, my field of view opened up and I noticed a window. The glass was of that used in bathrooms, eventually of that type with metal threads in it in order to avoid easy ruptures. Anyway, the window was closed. I felt panic. Then I knew. At that point, I realized to be a young woman, approximately 12 years younger than I was at that moment. She was me, but at the meantime, I was perfectly aware of myself, lying on the bed, in perfect safety. I knew she also saw me, and this must have given her/me a big relief at that moment, looking at that peaceful situation of a mum with her baby. She was aware of me and me of her. In some instances, our consciousness merged and I “got” some information about her. A kind of window between the dimensions of time and space opened up. My/her name was Gudrun Thaler and I was 26. (This was the only time I remembered clearly my own name in a regression). Some kind of mute communication took place, difficult to describe, it was some kind of blend. When I realized that stunning communication between us, it broke up, and I just became an observer, but, strange enough, the vision continued. There were men and women, many children, all jammed together in that place. All naked, all saw the others but tried to look away desperately trying to keep some privacy; nevertheless, everybody felt the bodies of the others, their fear. In particular, I noticed a man, emaciated, who looked at me without really seeing me. He seemed to consist just of a pair of horrified eyes. Screams, crying, everything was mixed while I (Gudrun) continued to fix that tile. I did not look at them. I did not see them. I looked at the tile dreaming to be a bird, flying out of that window, looping in the blue sky. They opened the shower head, but no water came out. I heard the voice of somebody (me?) suggesting to breathe deeply, this would make things go more quickly. I then saw myself (Gudrun) lying on the floor on the left side and an incredible exploding pain in my left breast. (Actually, this was not a “physical” pain for me as an observer; I felt it more on an emotional level. I should add that in no moment the vision really anguished me or created panic. During the hold time, I felt safely lying on my bed, while I was, contemporaneously, re-living these scenes. The shock came later when the mental process of what I had actually seen, initiated). Now the room was nearly empty, only in the center, all bodies were amassed one over the other. I saw the legs of a girl, some of her muscles were still fluttering, and I recognized my (Gudrun’s) younger sister in her. I observed that scene but did not feel to be “in a body” anymore and I could not make out my physical body in that place, probably it was among the other corpses, but it did not matter. The next thing I saw is how the corpses were pushed into the ovens, I saw how the men doing this, apparently having lost all of their emotions. They were Jewish, too. This is what I experienced. I was in shock for almost 2 weeks after this and only then I was able to write down a full report. I was not only shocked because of the vision, which was already strong, but also because of things that happened in the following days. While washing dishes, somewhat dissociated and loosely thinking about what I had seen, I wondered when I had pneumonia for the first time. This was very easy to remember, as I had just finished my degree in business administration and had been employed for one month in my first job. It was like a slap in my face when I realized that I was 26 when I fell ill for the first time, in 1998, the same age at which Gudrun Thaler died in the concentration camp. The next thing that came to my mind was that I felt ill at every end of the winter, between February and March. It became clear to me that this must have been the period of her death. The last time I had pneumonia I also suffered from pleuritis on the left side. My left lung has always been more afflicted than the right one, which did not wonder me anymore since I had clearly seen myself lying on the left side on the floor. Let us now switch to astrology and see what the charts show. All charts are cast with whole sign houses. I will start with my birth chart in order to make out the lung problem. The ruler of the 6th house (illness) is Mars, who describes inflammations or infections. His position in an earth sign describes a mixture of choler and melancholy, while Taurus suggests the neck and throat, suggesting infections taken from the throat. 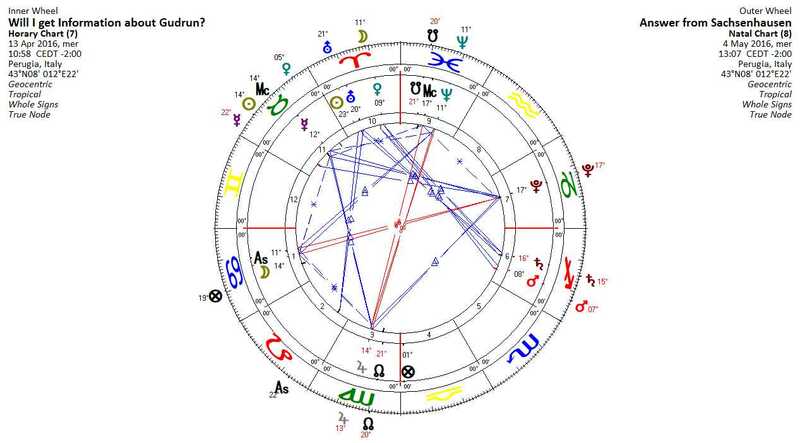 Venus is the strongest planet in this chart and the benefic in sect. However, she is in her detriment and in the 6th whole sign house, conjunct the Moon. Venus rules the 12th house. This house is generally associated with “hidden enemies”. In my case, these hidden things cause illnesses (Venus in the 6th). The planet is typically associated with women, and 5th century astrologer Rhetorius refers the 12th house to things “which happened prior to birth”. From this point of view, a woman from “prior to my birth” was the hidden source of my pneumonia. Venus is square Jupiter that generally rules the lungs. The square represents difficulties. Jupiter is strongly afflicted by being in its detriment and from its position in a cadent house, so something about the lungs does not work out well. Jupiter is below the horizon, which indicates generally the feminine or left side, which is also shown by being in a feminine sign (Capricorn). From that, we can suppose, that the major problem is on the left side of the lungs. Venus rules “closed places” (12th house). The planet describes things associated with beauty, cleanliness and the cure of the body, but she is also in her detriment and thus describes some kind of deviation or place where the promise (cleanliness) is not maintained (showers without water). Venus also casts an opposition to Pluto in the 12th house. That planet describes anguish, fear, violence. Pluto is sextile Neptune, which, among other things describes gas. Put together we can say that in a closed place (12th house) happens some kind of violence (Pluto), associated with gas, which causes illness (Venus in the 6th) linked to the lungs (square Jupiter). Saturn, the malefic out of sect and thus more difficult, rules the 12th house by exaltation and is positioned right on the 8th house cusp: the closed place brings death. Mercury in Aquarius, an air sign (death by inhalation gas), governs the 8th, in nearly exact square Saturn. In my diary I had noted the first time that I did not get to work because I had fallen ill of pneumonia: it was the 17th of February 1998. 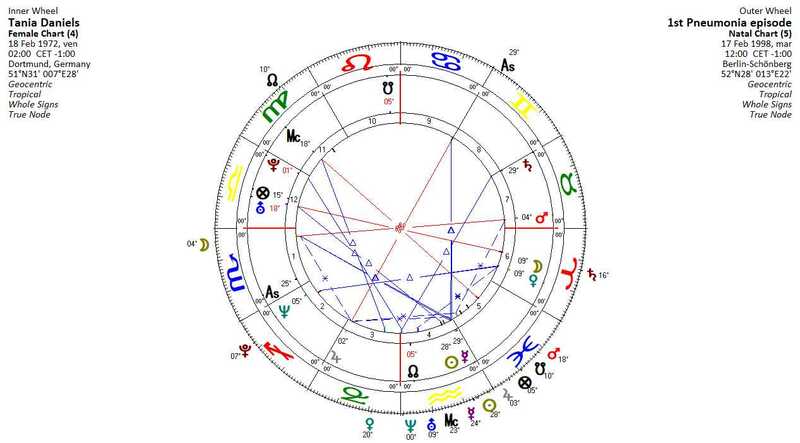 Transiting Jupiter had just entered Pisces and thus my natal 5th house; Mars was exactly on my IC at 18° Pisces. The IC affliction and highlighted 5th house  will be also relevant in the following charts. Here Mars (ruler of illness, but also my ASC ruler, expression of “self”) afflicts my roots (IC). Interestingly, the IC happens to fall in my 5th house, which, according to Sixteenth Century English astrologer William Lilly, is associated with the liver. Today we know that the liver is responsible for the immune system. For me, pneumonia came along with or was preceded by a strong pollen allergy (that I had never suffered from until that day). In later years, I found from Ayurvedic medicine that the lungs and liver are associated: when the liver does not work well during a change of seasons, the immune system is afflicted and that can reflect upon the lungs. This association is known in astrology since, from the earliest times, Jupiter represents both lungs and liver. Jupiter, Sun, Mercury and Uranus are all relatively close to my natal IC (18°Pisces). The IC is associated with one’s roots or family. If we live multiple lives, then we must have profound roots which connect, so to say, on this point. Mercury and Uranus were both combust. The combustion makes things “hidden” by the brilliance of the Sun (something is in front of you but you cannot see it). Mercury rules my natal 8th and the MC. At that time I still did not know which huge impact this episode would have on me. All this would unfold in the next several years. Saturn was exactly conjunct my natal Pluto. Saturn rules both my 3rd house and my 4th. The third house describes in Hellenistic astrology the “place of the goddess” or, what Chris Brennan calls “private religion”, : how one personally worships that what he/she calls “God”. I interpret this as the “personal belief system”, which is now confronted with Pluto in the 12th. “Can you stand the consequences of what you believe in?” might be a Saturn/Pluto question. 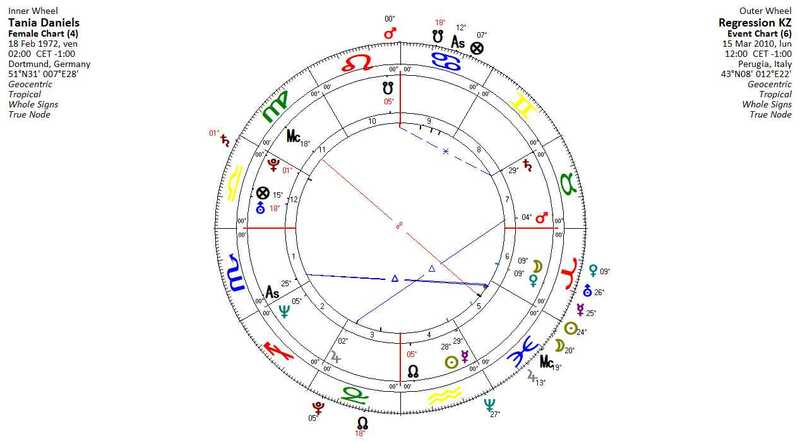 This describes some kind of deep memory process (12th house) in which old barriers (Saturn) are smashed down (Pluto). Interestingly enough, Saturn also describes siblings (ruler 3rd house). In that vision, I saw my (Gudrun’s) little sister in the midst of the corpses. Later I was thinking a lot about that younger sister, but I did not see her face, nor do I have any more information about her. I am only certain that I (Gudrun) felt guilty for her death. Saturn is associated with guilt. Transiting Mars (my ASC ruler) is conjunct the 10th from the Ascendant. This represents some kind of “coming out”. As Mars rules my natal 6th house, this refers to my illness coming out. The question I was asking myself just before the vision was “why do I suffer every year from that pneumonia?” The question had been answered. Sometime after the regression, a question came up in my mind. Why did I see these things? I did not see anything about the life of that young woman. So why these images and not others? Could it be possible that there was a precise purpose? I decided to try something which I felt, in the beginning, uncomfortable with. I was not sure what to think of it and if that technique would ever show to be reliable. – Which kind of connection do you have with my life and my pneumonia? Can I, to some extent, redeem you? What do I have to learn from your experience? And you, what would you like to learn from my existence? Can I encourage you? You suffered so much. – While I had been gazing at that tile, full of fear and panic, suddenly I was looking into your life, at that precise moment in which all of us understood what would happen to us. I saw you lying on the bed close to your child, so silently and quiet. You had been searching for contact with me. I did not know anything about you. I am not there anymore. I have moved on. Death is just a transition, but you can learn from this. -Gudrun, what can I learn from this? –To live in the here and now, for example, to love the moment, not “tomorrow”. You cannot know whether “tomorrow” will ever arrive. However, you can shape the “now” as you want to. You can realize something. Do not make just plans for “the day I shall be able to…” for tomorrow or for one year away. NOW you can do something. Once you die you realize how many “nows” you have lost. This is what matters. Start now. This was the lesson I got from Gudrun. And yes, it made much sense to me. I had been projected into the “future” all my life. “One day” was one of my standard thoughts. I tried to change this, after this experience and to become more aware of the uniqueness of each moment and its (often hidden) qualities. Eight years now have passed since this spontaneous regression and I never suffered from lung problems again. I thought this article was finished at this point. However, more things continued to come up. 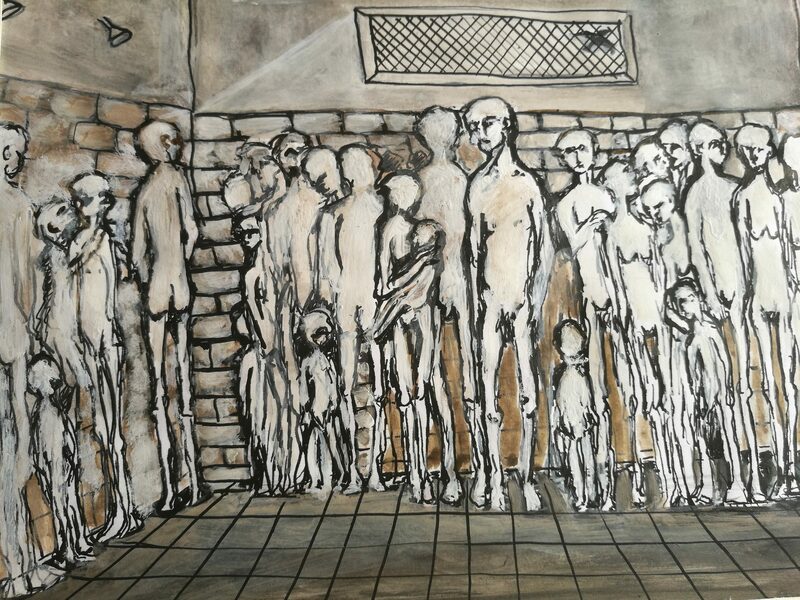 I searched on the web for information on prisoners in concentration camps. On April 13th, 2016, I send a request to the official archive of Sachsenhausen, the Memorial and Museum of Sachenshausen, asking if they had any information about a female prisoner with the name Gudrun Thaler. On May 4th, 2016 at 1.07 p.m, (roughly 3 weeks later, as Mercury went retrograde), I received an email from Sachsenhausen. The answer was negative. They had no information about Gudrun Thaler. But they also wrote me that nearly all information on prisoners had been destroyed by the Nazis prior to the arrival of the allied forces. Many thousands of names are missing and most of them will probably never be known. In order to gloss over their crimes, the SS did not compile records of their victims or they destroyed their documents afterward, prior to the arrival of the allied forces. But let us have a look at the chart. The most impressive contact in both charts (inner wheel horary, outer wheel answer email) is the Moon-Venus conjunction. In all of the earlier analyzed charts, I had been using Venus to describe “Gudrun”, as she is also the ruler of my 12th house. In the horary, Venus is EXACTLY conjunct my natal Moon/Venus conjunction. In this event chart, the Moon (bringer of news) contacts this very sensible point. 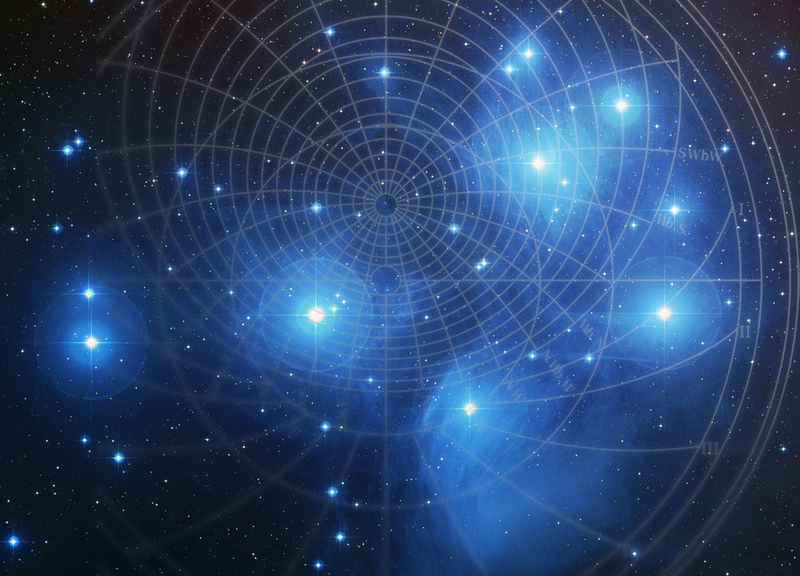 I would like to thank Joseph Crane for his friendship and support with this article and his invitation, together with Enid Newberg, to present my experience during his seminar on “The recurring and Evolving Souls” in Astrology at the Kepler College. I remember that, while “”receiving”” this name, I was complaining about it being old-fashioned and I was not sure if its sound was more as “Gertrud” or rather “Gudrun”. But the second name sounded more “correct”. Both were typical names in the first half of the 20th Century in Germany. Today they are rarely given. In the whole sign house system, the IC can fall either in the 3rd, 4th or 5th house. In this case, it is in the 5th house. The chart is cast for March 15th, 2010. The inner planets will not be considered. With the exception of the Moon, the other planets do not change their position very significantly in the next few days. As I write this report (April 15th, 2016), Jupiter is transiting my MC, so the result of this process is coming out, the Moon is waxing and in Gemini, trine to my natal Moon and transiting my 8th house, which not only rules “death” but also all kinds of metamorphosis and anguishing/shocking/trasforming situations. The 9th house, on the contrary, represents the “official” church and its doctrine. In a later regression I saw that girl in the bardo. She had long blond hair, somewhat curled, as if she normally carried a braid. Her name sounded like “Ilaria” but I am not sure of this. In that experience I just understood that there was no reason to feel guilty. She told me that her death had been decided by her, as well as mine by myself. Nobody leaves their body without their consent. That experience was pretty short. This is a mutual application because the Moon applies to Jupiter by direct motion, while Jupiter applies to Mercury by retrograde motion. 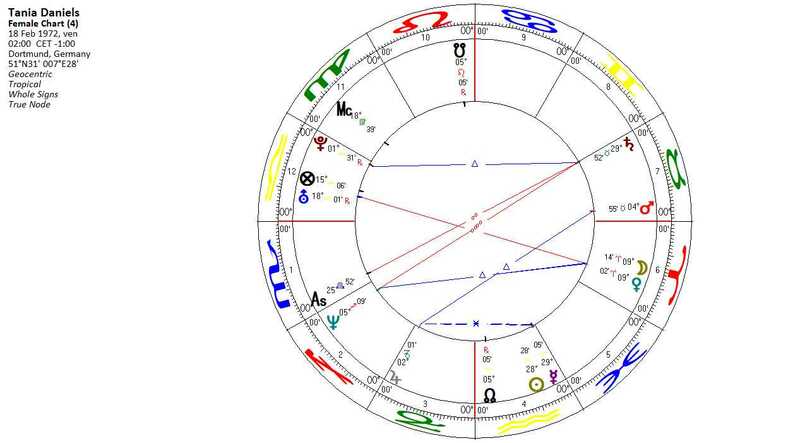 It will be interesting to see what will happen when transiting Mercury crosses my natal Saturn square Sun/natal Mercury on June 12th (after having gone retrograde). 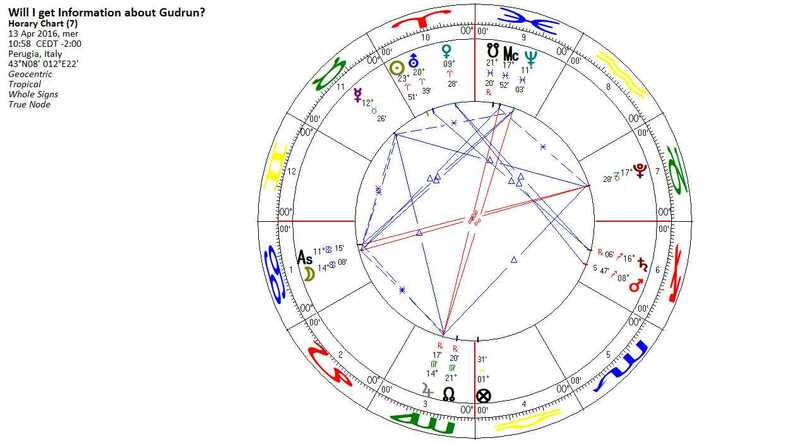 Interestingly, he stops his retogradation just on 14° Taurus, exactly trine Jupiter’s position in the horary.